We adopted our sweet little diva, Chloe, on March 30, 2012. I never thought that I could love another dog since my other dog Max was put to sleep on December 19, 2010 at 16 ½ years of age. Max was a Pomeranian/Keeshond mix and to this day, I miss him more than words can convey. But, about a year later, I found myself surfing the web and discovered the Pomeranian & Small Breed Rescue site. I would look at the available dogs from time to time, but I vowed that I would never get another dog. But as time went on, I was thinking about how nice it would be to get a rescue dog. I wanted to give another dog a chance at a good life, a happy life. I spoke to my boyfriend and he was 100% in support of us adopting a rescue. The volunteers and foster parents that operate the Pomeranian and Small Breed Rescue are simply amazing. Chloe had a wonderful foster mother by the name of Susan. I still keep in touch with her, sending her updates, pictures and videos. Before we picked up Chloe, we spent hours covering the wall-to-wall carpeting in the bedroom and living room with plastic, due to the fact that Chloe’s housebreaking status was ‘still in progress’. It took some time, and a lot of love and patience, but we are happy to report that Chloe is completely housebroken as of late October, 2012. Chloe has such a lovely spirit and she thinks that she’s the boss. She definitely has my boyfriend wrapped around her little paws and I must admit, she has me wrapped around her paws as well. We are still working on some basic commands but she is doing quite well. Chloe still acts a bit lazy at times when you approach her with her leash. She will literally flop over and stretch out her arm over her face as if she’s saying “Do I have to go outside?” She usually does this on the first walk and the last walk of the day. We are Chloe’s third and FOREVER family. We love Chloe dearly and cherish her. 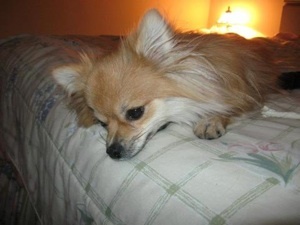 Thank you everyone at the Pomeranian and Small Breed Rescue for all that you do and for letting us adopt Chloe.